ON THIS DATE (September 22, 2004) ... For the second straight game, the Red Sox overcame an unnerving lapse by Keith Foulke and rallied past the Orioles in their topsy-turvy ride toward the postseason. 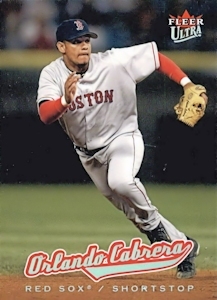 After Foulke blew a 6- 5 lead by surrendering a pinch homer to Rafael Palmeiro leading off the ninth inning, the Sox rescued him again when Orlando Cabrera homered off Rick Bauer leading off the bottom of the 12th for a rousing 7-6 victory before 35,103 at Fenway Park. Palmeiro's blast followed Javy Lopez's two-run shot off Foulke Tuesday and Melvin Mora's solo homer in the Orioles' win Monday. Cabrera's home run overshadowed a great achievement by David Ortiz in the seventh inning. With the Sox trailing, 5-4, Ortiz slugged his 40th homer of the season, a two-run shot that appeared to put Francona's lads on a glide path to a 6-5 victory. After the shot by Ortiz, Mike Timlin preserved the lead by pitching a scoreless eighth before he handed off to Foulke, who promptly prolonged his slump. Seven Sox relievers combined to work 6 2/3 innings, with Foulke surrendering the only run, though Mike Myers allowed an inherited run to score. Starter Bronson Arroyo, making his second attempt to win his 10th game of the season, let the opportunity slip away when he surrendered a one-out single to Javy Lopez amid a 4-4 tie in the sixth. Myers allowed Lopez to score on a double by Bigbie to give the Orioles a 5-4 lead before Ortiz countered in the seventh.